No parent wants to envision her child stealing. Stealing seems to go against everything we have taught our kids about kindness, consideration, responsibility and compassion. A child may be functioning wonderfully in all ways and still steal. But don't despair, it's more common than you think. It's incredibly common for children under the age of five to take things that don't belong to them. At this young age, they don't fully understand the concept of stealing or taking something without permission. Older, school age kids may lack appropriate control and have difficulty with impulsive behavior. And teens often steal because of peer pressure or as a way of rebelling. Kids may steal to get attention. Possibly they are not getting appropriate attention at home. Sometimes there is another, more serious problem, and the child is stealing to draw attention to himself. It's a cry for help in a way. Or, older kids may steal to get attention from peers. If stealing is the "cool" behavior, then kids may be desperate to fit in. Some kids steal out of necessity, because they don't have the resources they need to live a healthy life. Kids may steal food, clothing or school supplies . In other cases, kids steal because they want nicer items such as name brand clothing or electronics. If a child is experiencing turbulence in his family or some major change, he may steal as a way of feeling control because his living situation is out of control. Some examples are divorce, a move or death in the family. When adults are not stable and consistent, children may feel powerless and out of control. Stealing may temporarily instill a false sense of control over their environments. Children who have impulse control issues may steal because they act first and think last. Stealing may be one of many impulsive behaviors that parents experience with their child. 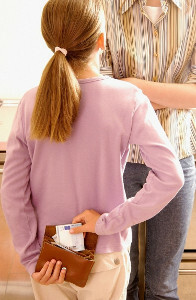 First, parents need to assess the reasons why their child is stealing. Then they can more effectively deal with the situation and talk with their child. When a young child steals, it's important to help her understand that it's not ok to take things that don't belong to her. Assist her in returning the item, and if possible, have her apologize for taking the item. Be gentle but firm, especially if it's your child's first offense. If you give angry attention, your young child may continue to steal to get this attention again. And if it's a continual problem, set up a behavior chart to track the behavior. If your child is older and understands that stealing is wrong, talk about the natural consequences of stealing such as loss of trust and responsibility with parents as well as peers. If possible, assist your child in returning the items and have your child apologize. And if stealing is a regular activity, give appropriate consequences. For teens and preteens, you can use a behavior contract. And if your child is a thrill seeker and seems to be stealing because he is bored, find some positive extracurricular activities to keep him busy. If you are a family lacking resources and your child is stealing necessities, see if there is any way you can cut down on other things in order to better afford the basics. Seek out support and assistance for your child if possible to make sure that she is getting the food, clothing and school supplies she needs. Children may continue to steal. If that is the case, seek support in the form of a school counselor or family therapist.